Very few of us enjoy spending time doing laundry and the laundry room tends to get overlooked when it comes to decorating. But just a few changes can make your laundry room more pleasant and the task less dreary. The key is to create a space that makes you smile. It can be sleek and modern or farmhouse style; and whether you just add a coat of fresh paint or remodel the entire room it should express your personality. Pick the colors you love and use accessories that express your style. Take a look at 25 decorating ideas that you can use to customize a laundry room you'll love. Start with the walls in your laundry room. Most laundry rooms are small and if you've been afraid to give decorating with wallpaper a try, it's a good place to start. With so many options in design, you can create an accent wall or cover the entire space. The least expensive way to change any space is paint. A new coat of paint covers lots of problems and freshens the space. And if you work with a bit of painter's tape in a graphic pattern, you can create a totally unique look. Gather inspiration from Lauren at Rustic Honey and see how she transformed her laundry room. Stenciling is another way to add interest to a laundry room wall. You can do the entire room or just an accent wall for very little money, just a bit of your time. Kelly at View Along The Way took her laundry room from beige blah to fabulous for less than $200 in part by creating a custom stenciled wall. Ceramic tiles are a perfect choice for the laundry room because they are easy to clean, resistant to damage from water and cleaning products. And, they come in so many styles and colors you are sure to find the look you desire. This wall from Fireclay Tile offers a bit of Mediterranean flair to a standard laundry space. If a standard backsplash or solid tile wall is too boring for you, create a freeform design on your laundry room wall with mosaic tiles. This design was created by Fireclay Tile but just use your imagination to create what makes you smile. 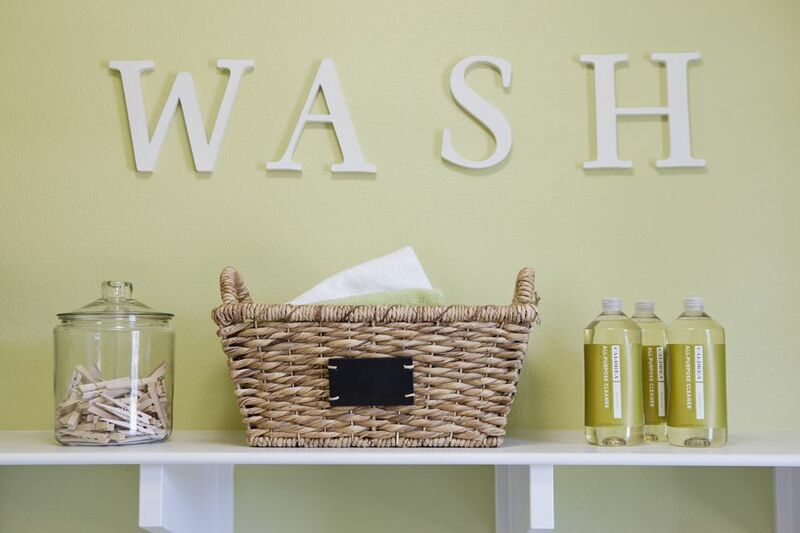 Have a message you want to share with all those who enter the laundry room? Say it with a vinyl decal. If you're crafty and have a vinyl cutting machine, you can design words and shapes. Or, just choose from one of many decals offered for sale. Vinyl lettering doesn't just belong on the walls. These decals from The Sticker Hut add a bit of flair to the washer and dryer. Even better, add a bit of advice to the front of the washer like "Check Your Pockets". That might just save a cell phone from disaster. The lettering can also be used to label the contents of storage jars, tins, and boxes. Stop for a moment and think about why you're in the laundry room. You are, most likely, doing laundry for those you love. Why not create a display of family photos to remind you that you love them even when they present you with sticky, messy laundry? This display from Lacy Bella combines the perfect slogan and photo. This laundry room is simple, well-organized and totally functional. But it is the artwork that grabs your eye. Allow the artwork in your laundry room to take you to your favorite place while you fold countless piles of laundry. Use one statement piece of art or create an inspirational collage of several pieces. If your style is more modern, choose some graphic prints like these from Rhondavous Design on Etsy. The prints add color and some even serve as a reminder on how to read clothing care labels and remove stains. Could this cabinet hardware shaped like clothespins be any more fun? The ceramic hardware is hand-sculpted and painted by artisans and has steel mounting hardware. They can be used as cabinet or drawer pulls and customized for your color scheme. No matter if you live on a farm or in the city, if you love the Farmhouse style of decorating, the laundry room is a perfect spot to create the look. Check out what the bloggers at Knick of Time created with vintage equipment and sentimental accessories. If you decide to create a little country charm in the laundry room, these accessories fit perfectly with the scheme. If you're crafty, you can make or own. Or, shop local craft fairs or online to find the finishing touch for your space. Vintage ads are perfect for the laundry room. They can be mid-century housewives in aprons, retro 70s funk, or European sales posters. Big or small, placing a rug to the laundry room space adds design style and comfort underfoot while working. Just look at this mudroom/laundry room photo. The first thing your eye takes in is the red carpet welcoming the family in. If you can't find the rug of your dreams, just make your own. Lowe's Home Improvement store can walk you through the steps. Most laundry rooms have an ironing board. If you don't have a built-in ironing board and yours is hanging in a prominent spot in the laundry room, make it a piece of art. Gone are the dull grey covers of yesteryear. There is an ironing board cover to match any decor. There is absolutely no reason to have a boring plain white laundry basket. Pick the colors that make you happy. Custom cabinets are very expensive but you can still have storage by adding some basic shelving like this from Dream Structure that fits your new colorful laundry baskets. Use an old dresser or build a frame and stack in a basket for each member of the family. Take time to label the baskets and you can use them for both sorting laundry loads and for delivering the clean clothes back to the owner. Storage is always an issue in the laundry room and nothing works much better than clear jars. They can hold detergent, scent enhancers, buttons, change, clothespins, and more. If the container is holding laundry products, be sure to label each jar. Select a glass drink dispenser for liquid detergents and fabric softeners. Not everything looks pretty in a glass container. That's why baskets are so popular to hide all of the things we need but don't want to display. Baskets can hold all those batteries, flashlights, light bulbs, and flotsam that seems to land in the laundry room. Just be sure to add a label! Closed cabinets are expensive and not as flexible as open shelving. But things don't always stay orderly. So, add a curtained area above the washer and dryer. This look form Lucy Interior Design hides a hanging rod and is the perfect spot to stash supplies you use every day. If you liked the curtain over the washer, you'll love the skirt hiding the plumbing of a laundry sink. Simply find a decorative fabric and create a sink skirt or curtains for lower cabinets. This skirt from Phoebe Howard adds color and warmth to the room and adds hidden storage. One of the most important components in the laundry room is lighting. You need to be able to see stains on clothes, see appliance dials, and read instructions on products. Most of the time, the standard overhead lighting is pretty dull and sometimes dim. Upgrade to a fashionable fixture and make sure that it sheds enough light to make working comfortable. One of the best additions to any laundry room is task lighting. If you can't afford to add lighting under upper cabinets over a workspace, consider purchasing a lamp that casts the level of daylight brightness. It will change your laundry karma.